Area : 1615 sq. km. Temperature : Max. 29°C and Min. 15°C in Summer. Mokokchung is situated 162 km from Kohima via Wokha 70 km from Zunheboto, 115 km from Tuensang, 102 km from Amguri (Assam) and 103 km from Mariani (Assam) at an altitude of 1325 mts. above sea level. This picturesque townis the cultural centre of the Ao Nagas. White water rives of Milak and Tzula are of scenic interest and has a lot of potential for monsoon angling. The foot imprints of China and Itiben – the Romeo and Juliet of the Aos, are found preserve in several places in the Ao ranges. Christmas and New Year are also celebrated with great enthusiasm. Ungma: This is the oldest and biggest Ao village. According to legend, the early Aos settled after coming from Chungliyimti. This village is many centuries old and can be of great interest to people who have a desire to peep into Ao folklores customs and traditions. Langpangkong: History speaks of an Ahom king, who fled his capital due to court intrigues and rivalries and had taken refuge in the Langpangkong range, along the Dikhu and Tzula rivers. The cave where he took shelter still remains. Molung: This village has the distinction of having the first American Baptist Mission been established in the Naga Hills in 1872 and the earliest Mission building is still intact and preserved in the village premises. An ancient leechi tree, planted by Dr. E. W. Clark, the first American Missionary, still exist. Longkhum: A vanguard village in the days of head hunting is situated at an altitude 1846 mts. above sea level. 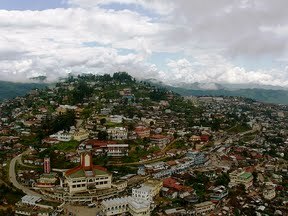 It is 17 km south west of Mokokchung and the village commands a beautiful view of the surrounding hills and valleys. Mongzu Ki – eagle’s eyrie – is situated at a high precipice where eagle has nested for centuries. From Mata Yimkong, the top of the hillock where one stood a fortress, the Himalayas look fascinating. This entry was posted in Mokokchung, Nagaland and tagged Langpangkong, Longkhum, mokokchung map, mokokchung town, Molung, Ungma. Bookmark the permalink.